We are going to Ahmedabad on my kid’s birthday. We will go to Thol Wildlife Sanctuary while going to Ahmedabad as it come in our way. We saw dark black color medium sized eagle perched on tree. We confused in eagle in our beginning of birding but now we can know that, it is GSE mean Greater Spotted Eagle. Greater Spotted Eagle is a medium-sized eagle. 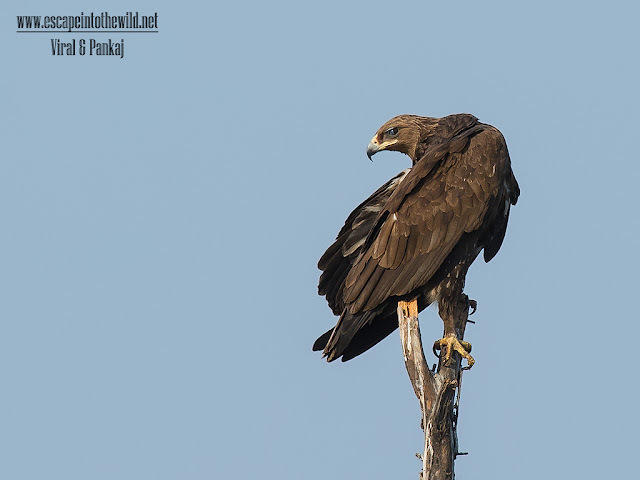 Greater Spotted Eagle only has white spots as a juvenile, when they extend in bands across the upperwing. By adulthood, the spots have faded leaving dark brown feathers across the head, body and wings, with slightly paler flight feathers on the upper side. The head is small for an eagle. In the winter quarters prefers wetland habitat. In its winter range, the species is more social than when breeding. Small flocks of up to ten birds or so, of varying age, can be seen to patrol the land together. They also associate with other Accipitridae such as local and/or migrant black kites (Milvus migrans lineatus and govinda) or steppe eagles (A. nipalensis), distinctly smaller and larger raptors, respectively. We saw flock of 6 eagle in our recent Nalsarovar trip.